Azure Automation accounts can be created through Azure. This method provides a browser-based user interface for creating and configuring Automation accounts and related resources. This quickstart steps through creating an Automation account and running a runbook in the account. Click the Create a resource button found on the upper left-hand corner of Azure. Select Management Tools, and then select Automation. Enter the account information. For Create Azure Run As account, choose Yes so that the artifacts to simplify authentication to Azure are enabled automatically. It is important to note, that when creating an Automation Account, the name cannot be changed after it is chosen. Automation Account names are unique per region and resource group. Names for Automation Accounts that were deleted may not be immediately available. One Automation Account can manage resources across all regions and subscriptions for a given tenant. When complete, click Create, to start the Automation account deployment. For an updated list of locations that you can deploy an Automation Account to see, Products available by region. When the deployment has completed, click All Services, select Automation Accounts and select the Automation Account you created. Run one of the tutorial runbooks. Click Runbooks under PROCESS AUTOMATION. The list of runbooks is displayed. By default several tutorial runbooks are enabled in the account. 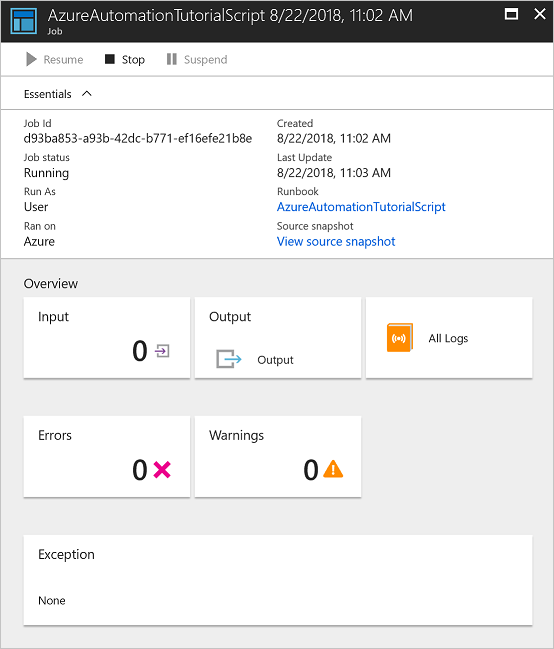 Select the AzureAutomationTutorialScript runbook. This action opens the runbook overview page. Click Start, and on the Start Runbook page, click OK to start the runbook. After the Job status becomes Running, click Output or All Logs to view the runbook job output. For this tutorial runbook, the output is a list of your Azure resources. 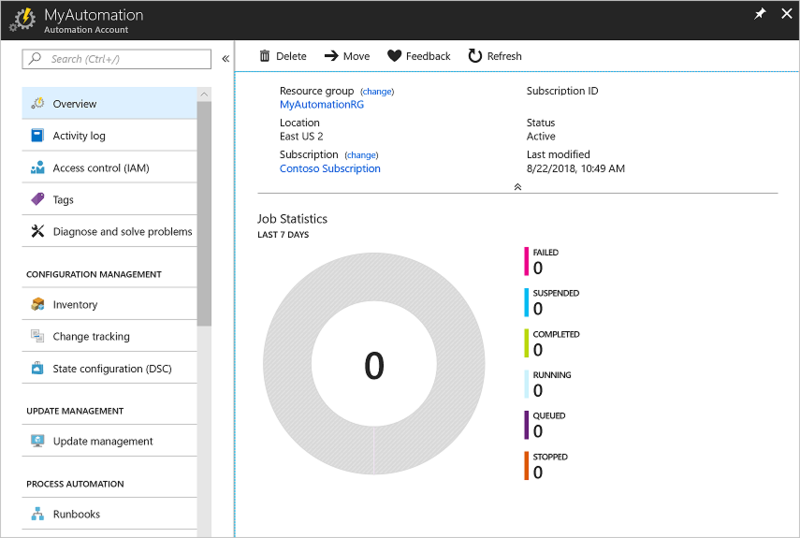 In this quickstart, you’ve deployed an Automation account, started a runbook job, and viewed the job results. 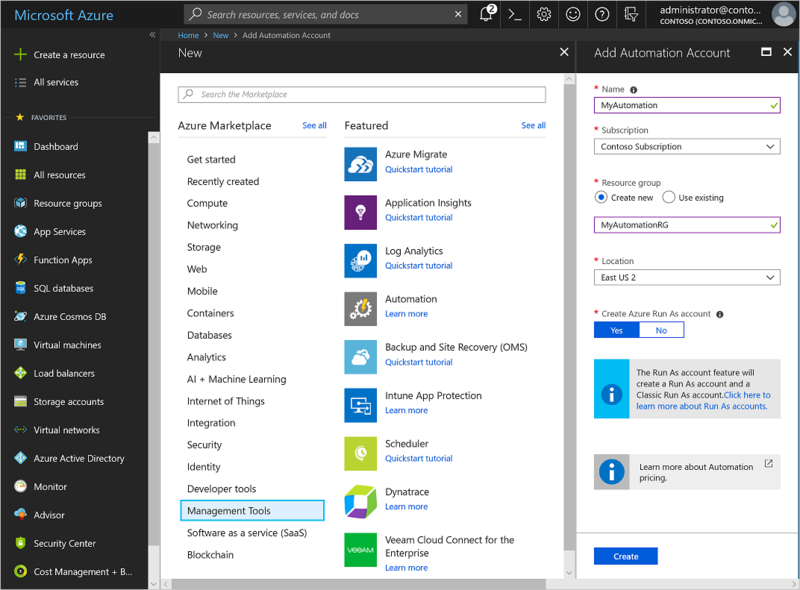 To learn more about Azure Automation, continue to the quickstart for creating your first runbook.